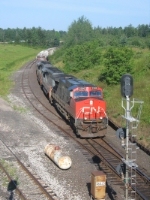 Description: CN train 340 rounds the curve at MP 460.25 head east out of Superior into the blinding sun. 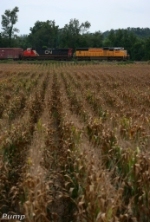 Description: CN Train 149 heads west, following very closesly behind Amtrak's Blue Water. Description: westbound freight crosses main st. Description: As the sun rises higher in the sky, CN 148 heads east along Track #1 at the Amtrak station. Title: CN 2596 going in the "hole"
Description: CN 2596 leads an ore train eastbound over the summit of the Alleghenies on the B&O line at Sand Patch PA. Description: The power off of NS 184 rests near the engine pit in Bellevue Yard. Description: Getting underway is UP Train MNLTT 19 at the UP North Dexter Crew Change Point. Description: CN 2596 trails the 2298 as they start to put the Commercials cars away. Description: After getting a new crew, L506 starts to go to work with an ES44 and Dash 9 for power. Description: After having a good day handing off cars, the WC Transfer is done for the day. All that needs to be done is to put on some hand brakes, and the crew can call it a day. Description: Decatur, IL to Memphis, TN A432 running south through Centralia, Illinois.